Panasonic has developed a monitoring digital video recorder revolutionary to the industry, the WJ-RT208. Consolidated in one unit, the WJ-RT208 is fundamental to a monitoring camera system, promoting perfect synchronization of image and sound. This product combines the two most sought after features in a recording system: high definition and long-period recording. 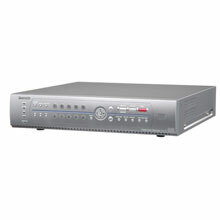 The WJ-RT208 boasts excellent scalability from an interlocking network function and Panasonic's systems controller. In addition, it is designed to offer system stability for trouble free operation, providing safe, functional and fast product. Used in combination with Panasonic's high performance related devices, such as the Super Dynamic III series camera, the WJ-RT208 is the ideal Digital Video Recorder solution. With Panasonic, receiving a total solution is ensured. The Panasonic WJ-RT208/500 is also known as PAN-WJRT208500	or WJRT208500	.